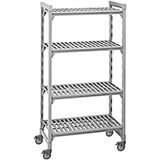 We offer mobile shelving starter units that facilitate easy movement of your shelving in storage areas. Our pre-configured shelving units are equipped with standard or premium heavy-duty casters. Units with standard casters include Swivel Chrome Casters. These casters are ideal for being used in dry storage environments. For use in wet areas or in walk-in refrigerators and freezers, it is recommended to employ the units with premium casters, which feature non-corrosive swivel casters. 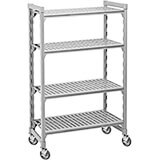 Our mobile shelving starter units are available in different sizes to accommodate you. You can customize them by choosing the height, depth and length as per your storage needs. These shelving units are made from durable material and they come with posts and traverses constructed with a steel core. Select the desired height and number of shelves. Mobile Shelving Starter Units, 67" High with 4 Shelves. Mobile Shelving Starter Units, 67" High with 5 Shelves. 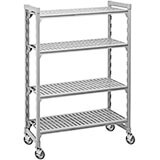 Mobile Shelving Starter Units, 75" High with 4 Shelves. 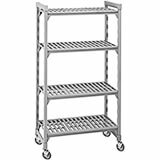 Mobile Shelving Starter Units, 75" High with 5 Shelves.